Teak type furniture are high quality products that are designed and created to last a lifetime. Left to age naturally these types of hardwoods will become a soft silvery gray color. They are generally impervious to rain, snow, frost or sunlight and needs no paint or preservatives for general use. Why are Teak type hardwoods always the first choice for outdoor use (boats, ships, outdoor furniture)? These immensely stable timbers have a natural high oil and rubber content, a built-in water repellent which makes it virtually immune to rotting & gives them a lifetime of use. The dense fibers of Teak matures over time to create not only one of natures most structurally sound and stable timbers, but also one of natures unique species that posses an inherently high content of oil and rubber. The essential oil contained in this species of wood has an inbuilt natural water repellent which resists the action of water and prevents the rusting of iron, making it virtually immune to rotting as well as resistant to termites. In times of old and that of the tall ships, Teak’s weatherproof qualities made it a first choice for sailing vessels. As these later became obsolete carpenters utilized the salvaged timbers to fashion the first outdoor Teak Furniture, thus the illustrious birth of this now specialized industry. Teak’s ability to resist the extremes of both summer and winter is an internationally recognized phenomena. Without any maintenance this product will last 75-100 years in any environment in the USA. For several centuries, these special qualities have made Teak wood the preferred choice for marine decking and construction. Teak wood has and always will be the choice wood aboard ocean liners, as it is capable of withstanding even the harshest elements such as salt water, and is the reason that it is today, the premium timber for Outdoor Furniture. Teak is an extremely durable hardwood. It requires little care and no preservatives or treatment of any kind to protect it from the elements. Natural Teak hardwoods will gradually weather to a handsome silver gray color if left outdoors. You will begin to notice the "graying" after approximately 6 months, depending upon the amount of sun and rain the furniture is subject to. Total weathering will take up to several years. This silvery gray 'patina' which develops over time gives Teak furniture a distinctive appearance. The color resulting from this natural aging process is considered to be very attractive, and allows Teak furniture to blend in well with many outdoor environments. Teak left in this state is easily maintained, and needs no treatment whatsoever to give many years of service. This is about as easy as a maintenance plan as it is possible to get! In fact, teak is naturally loaded with self-preserving elements such as rubber, oil, and even some silica. By being naturally lubricated and water resistant, Teak actually treats itself. It's even termite resistant, thanks to the silica, which repels wood-eating bugs. Teak care is simple once you get the hang of it. For starters, it may be helpful to know how hardy and self-sufficient teak is. It's definitely not one of those delicate or temperamental woods that need painstakingly special care. Teak is a deciduous hardwood tree from the highlands of south-east Asia, it does not come from tropical rainforests. Teak type hardwoods have a naturally high oil content which makes them both stable and resistant to rotting when exposed to climatic extremes. For several centuries these special qualities have made these hardwoods the preferred choice for marine decking and construction and is the reason that it is considered the premium timber for outdoor furniture. The weathering process Over a period of time in an outdoor environment untreated Teak will weather to a silver gray, the length of time will vary with exposure to different climatic conditions. 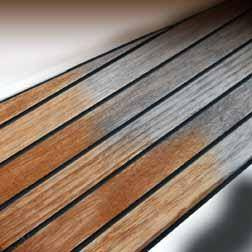 Teak oiling Treating with Teak oil or other preservatives is not necessary; it will not extend the life of your furniture and is purely cosmetic. We do not recommend oiling your furniture as it creates unnecessary maintenance. However, if you wish to preserve the 'just bought' look of your furniture you should apply Teak oil when the furniture is new. Follow the manufacturer's recommended application (generally treat 1-2 times a year), taking care with oil-soaked rags as they are highly combustible. Cleaning teak Once Teak type hardwoods have weathered the color will be enhanced by an annual scrub, in the Spring, with soapy water or a Teak cleaner to remove accumulated dirt. Alternatively you may use a pressure hose with a fan or multi-nozzle jet. However, great care should be used since failure to abide by recommended procedures may result in permanent damage to the furniture. Where a pressure gauge is fitted it should be set to a pressure of 60-80 bar (900-1200 psi). A distance of 15-20cm (6-8") should be maintained between the nozzle and the surface to be cleaned. Grease spot removal To remove grease spots we recommend a degreasing agent and gentle scrubbing brush, rinsing off with clean water.